Hey guys! Is it already Monday again? Blah I say!, BLAH!. At least I have a mani that is anything but blah to share with you today! (at least in my opinion, haha). I wanted to do another spring-feeling mani, so this is what I came up with. 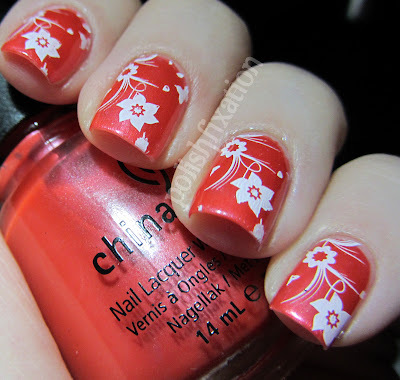 This is China Glaze Coral Star stamped with Konad White Polish. 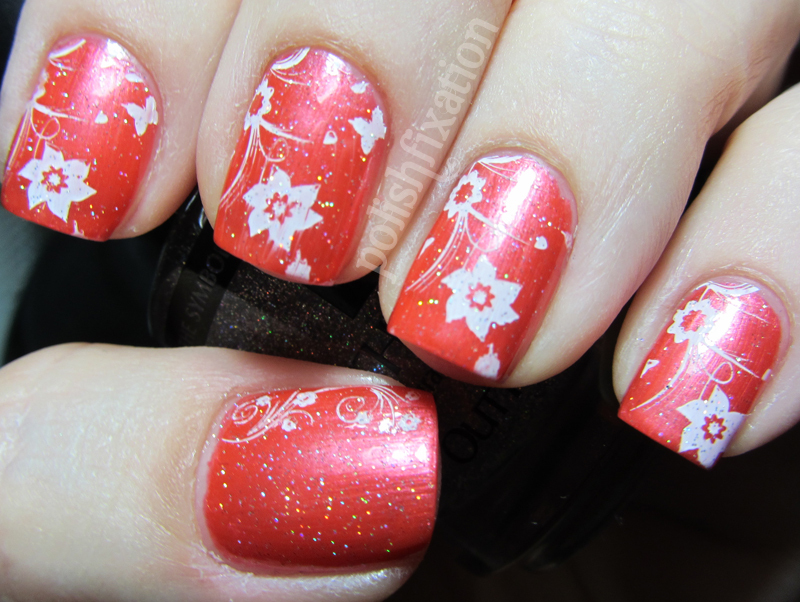 I used my RA-102 stamping plate (Red Angel), and stamping plate T40 for the image on my thumbs. The first pic is the mani before I added the finishing touch of Out The Door Northern Lights top coat. I really love this mani, and it held up incredibly. I have worn it for almost 5 days and I have no chipping and no tip wear at all! What do you think of this? What's your favorite spring mani color? Very pretty and that China Glaze is beautiful. Beautiful! It is very spring-y! I am SO jealous of your stamping skills. I just haven't been able to master it! Mine look like my kids have drawn pictures on my nails. I keep trying. Your lovely mani makes me want to dig out my stamper. . . . .again. Thanks for sharing! Cute! I like the white flowers, very spring like! Absolutely gorgeous!!! Love the colors!! This is stunning!! I wish I had your stamping skillz! I love it! Super cute! And five days is amazing. My favorite spring color... hard to say. I'm still sort of in love with my Butter London Union Jack Black, but that's hardly a spring color. Lol. This is really great!! I love it! I'm so glad I inspired your lemming for this color. It's one of my favorites and it looks gorgeous on you! I need to work on my stamping so I can do this too! I think coral and lilac are my favorite spring colors if what I've bought this spring is any indication.